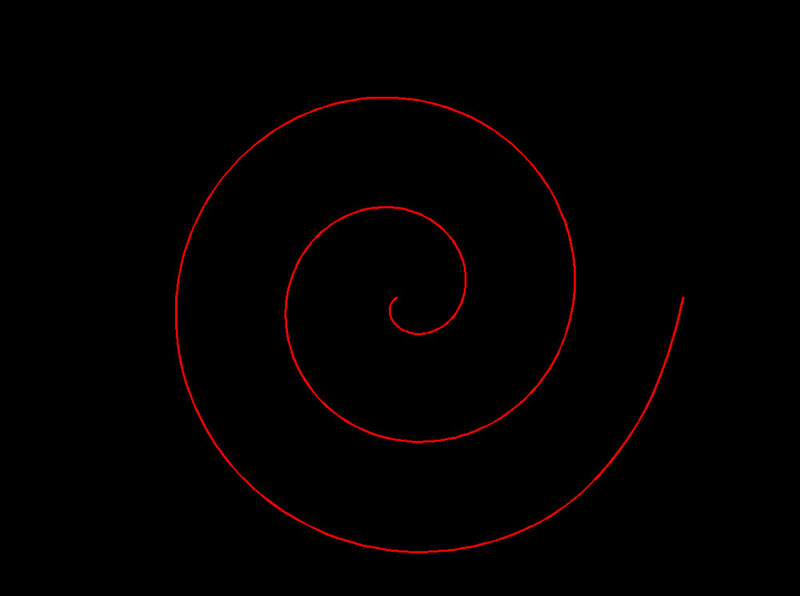 The first part of my video is a demonstration of how I manually draw a logarithmic spiral. The angle between the radial lines will determine the angle of the spiral. More lines will make a spiral that increases in radius at a lower rate than one that is drawn using fewer radial lines. A cross section of a shell is a logarithmic spiral. The cool thing about a a logarithmic spiral is that no matter how big or small it becomes the proportions stay the same. There is another kind of spiral called an Archimedean spiral that maintains a constant distance between the whorls along a radial line. The larger this spiral becomes, the more it looks like a circle. Examples of this kind of spiral include rolled up sleeping bags, the inner part of a scroll chuck on a lathe, or the internal parts of a scroll compressor in some air conditioning units. 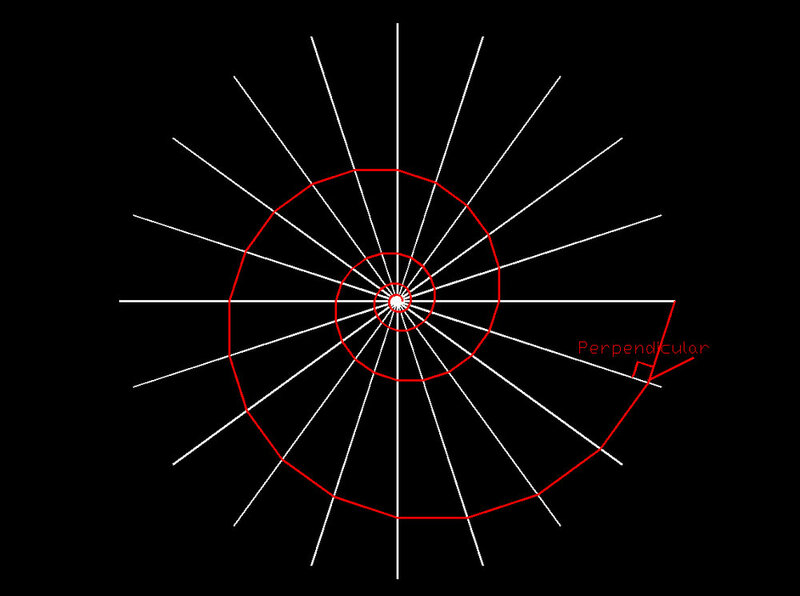 A logarithmic spiral can be drawn in Autocad by starting a polyline at the end of one of the white radial lines and using perpendicular object snap to extend the spiral to the next radial line. Mathematically, you will never reach the center point. As you zoom in towards the center you might notice how the proportions of the spiral remain the same. You can then make the spiral a smooth curve by using the "fit" command for polylines. Fit is better than spline because it will not move any of the vertex points. An Archimedean spiral can be drawn by drawing concentric circles (draw one circle, then make the others by offsetting). Radial lines are also needed. 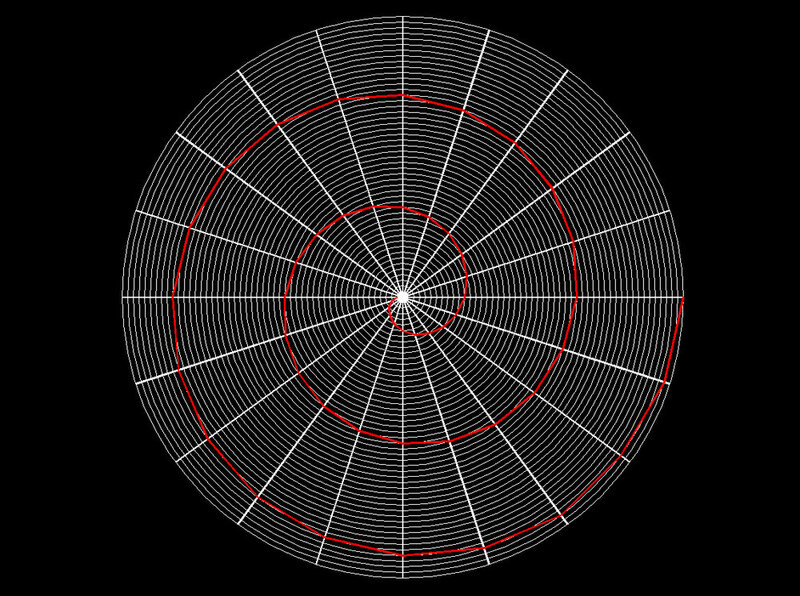 The radial distance between circles will be equal to the distance between whorls divided by the number of radial lines. For example, if you wanted a spiral with 2 inches between whorls and you have 20 radial lines, then the distance between circles would be equal to 0.1 inches. Draw a polyline starting at the end of a radial line to the intersection of the next radial line and the next circle. This spiral will reach the center point. This is the kind of spiral can also be drawn by winding a string (with a metal washer tied to the end) around a cylinder - or wrapping a rope around a tree in the middle of your yard with your lawnmower.